LG has made an alternate home screen experience available to G5 owners that brings back the app drawer. The G5 initially launched with LG's UX 5.0 home screen experience, which removed the app drawer and kept all apps on the home screen panels. 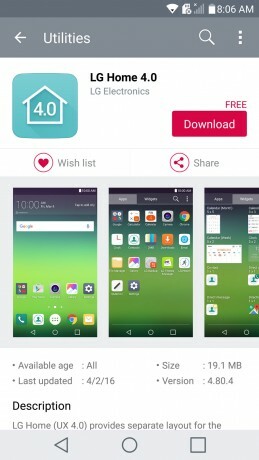 The Home 4.0 home screen experience is available to download from the LG SmartWorld app on G5 handsets. Once installed, it returns the app drawer to the home screen, leaving the panels themselves available for widgets and other customizations. Within the app drawer, G5 owners can arrange and hide apps however they wish. Users can switch between the 5.0 UX and Home 4.0 whenever they wish. The more traditional home screen experience is free to download from LG.